I got to thinking this morning that this guidance from 1928’s What a Young Man Ought to Know might be a helpful reminder right now. We seem to have lost some of this common sense in recent times. Keep cool, everyone! I strive to live by this advice from Richard Wells each day ~ even though it seems harder and harder sometimes to do so! We must all try, as much as we can. Here’s a good quote regarding “wearing the mask of pretense” from Lillian Eichler’s 1941 The New Book of Etiquette. I thought it might come in handy right now! Some advice from Richard A. Wells, Manners, Culture and Dress, 1891, on affirming facts. Coming out of the Woodwork: Should We Follow the Leader? Sears Charm School Binder Available! 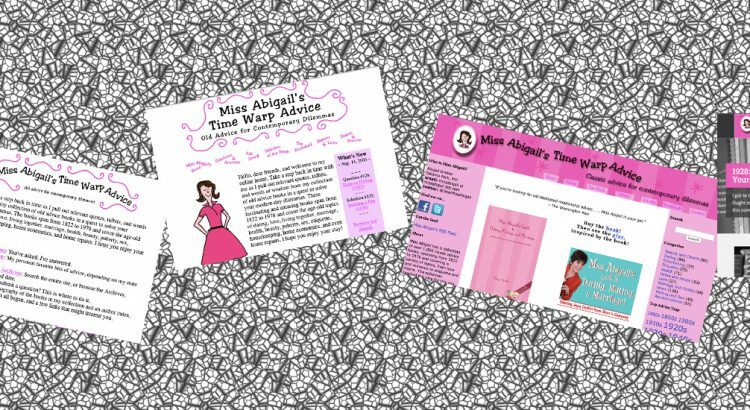 Miss Abigail has a collection of over 1,000 classic advice books, spanning from 1822 to 1978 and covering a variety of topics, from love and romance to etiquette and charm. The collection sparked the idea for this site, then a book, Miss Abigail's Guide to Dating, Mating, and Marriage, which has inspired an Off-Broadway production of the same name. This Miss Abigail thing started in 1997 so there's plenty here to keep you entertained even as regular updates have slowed down. Thanks for stopping by -- I hope you enjoy your stay!